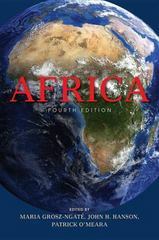 Africa 4 Edition Since the publication of the first edition in 1977, Africa has established itself as a leading resource for teaching, business, and scholarship. This fourth edition has been completely revised and focuses on the dynamism and diversity of contemporary Africa. The volume emphasizes contemporary culture-civil and social issues, art, religion, and the political scene-and provides an overview of significant themes that bear on Africa's place in the world. Historically grounded, Africa provides a comprehensive view of the ways that African women and men have constructed their lives and engaged in collective activities at the local, national, and global levels.